Mike is a full time folk/bluegrass musician with his roots firmly planted in the West. His mother's family settled in south eastern Wyoming after the Civil War and his father's family came across the plains with the first Mormon handcart company. Mike purchased his first guitar and began playing music during his first year of High School (1975). By the time he had graduated, he was learning to play the banjo and had formed a folk-rock trio. Over the years, Mike has taught private lessons, recorded as a studio musician, competed in (and won) music competitions, been part owner in a music store, and has performed throughout the western states in various ensembles. His music has been featured in movies, television series, and a PBS documentary. Familiar to audiences in Utah as the driving force behind the folk/bluegrass band Blue Sage, Mike Iverson is now known worldwide for his contributions advancing the art of clawhammer banjo. Unlike it's more popular bluegrass cousin, clawhammer is the original technique used to play the five-string banjo and came with the instrument as it made the journey across the ocean from West Africa. This unusual playing technique is now going through a renaissance as banjo players everywhere are starting to realize the potential of this ancient form of play. 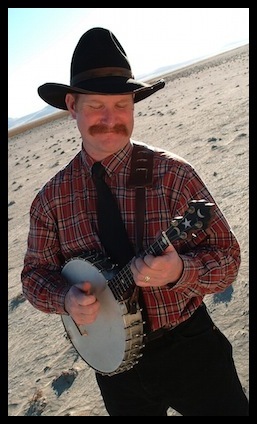 Mike Iverson is one of the leading players in this movement and has received worldwide accolades as an arranger, instructor, author, and creator of one of the world's most popular clawhammer banjo websites. “....you can’t talk about musicians and music of the West without mentioning Mike Iverson. The finest frailing banjo player around, he also plays a variety of string and folk instruments and sings from an amazing repertoire of songs.” -Northern Utah’s Junction Magazine.